and skateboarding is no different. The Ollie forged a new identity for skateboarding after its invention in the 1970s, and it lies at the root of nearly every significant move in street skating today. This groundbreaking no-handed aerial has also affected the evolution of surfing and snowboarding, and has left a permanent impression upon popular culture and language. This is the story of the Ollie, the technology that set the stage for its creation, and the skaters who used it to start a revolution. OVER SEVEN YEARS IN THE MAKING, A Secret History of the Ollie tells in part, how a small, unheralded group of skaters revolutionized skating around the world. Although the no-handed aerial skateboard maneuver known today as the Ollie is nearly 40 years old, its influence on skateboarding remains, and has never been surpassed. Make no mistake, the Z-Boys were an important part of the emerging American skate scene during the 1970s, but they weren't the only domain. In the state of California alone, besides Santa Monica and Venice, there were many other hot spots. Some of those places included San Diego, Upland, Santa Barbara, Ventura, Santa Cruz, Salt Creek, Vista, Los Angeles, the San Fernando Valley, Oxnard, and San Francisco—all equally influential and significant for the skaters and innovations they delivered. But far, far away from California, on the Gold Coast of Southern Florida, thousands of miles from the West Coast skateboard industry and media, there was another tale unfolding. 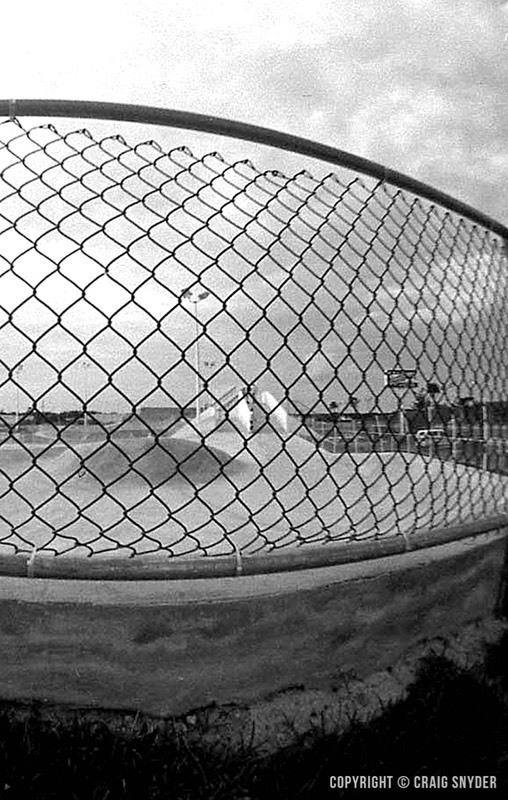 More obscure and under the radar, the Florida scene would have a dramatic and immeasurable impact on skateboarding, allowing it to literally take flight. It all started with the invention of the Ollie, a magical no-hands aerial and the signature move that would forever change skating. Created in 1978, the Ollie, without a doubt, is the maneuver that changed skateboarding for all time. In A Secret History of the Ollie , author, photographer, and skater Craig B. Snyder follows this revolutionary no-handed skate trick from its humble beginnings in his hometown of Hollywood, Florida, to the present day in this new historical multi-volume work with an origin story as dramatic and magical as the move itself. Illustrated in color throughout, A Secret History of the Ollie is not just the story of the Ollie, but a history of skateboarding like no other. Over 1200 images and photographs, many of which have never been published before, accompany 912 pages of some of the more crucial moments in skating history including the birth of the first aerials on land and in surfing. "A Secret History of the Ollie is truly amazing. It is beyond anything that has ever been published before." —Michael Brooke, publisher of Concrete Wave Magazine and author of the books "Skate Legends" and "The Concrete Wave"
"Just started reading it . . . can't put it down. If I ever get to the point where I can afford employees at the Morro Bay Skateboard Museum it will be required reading." 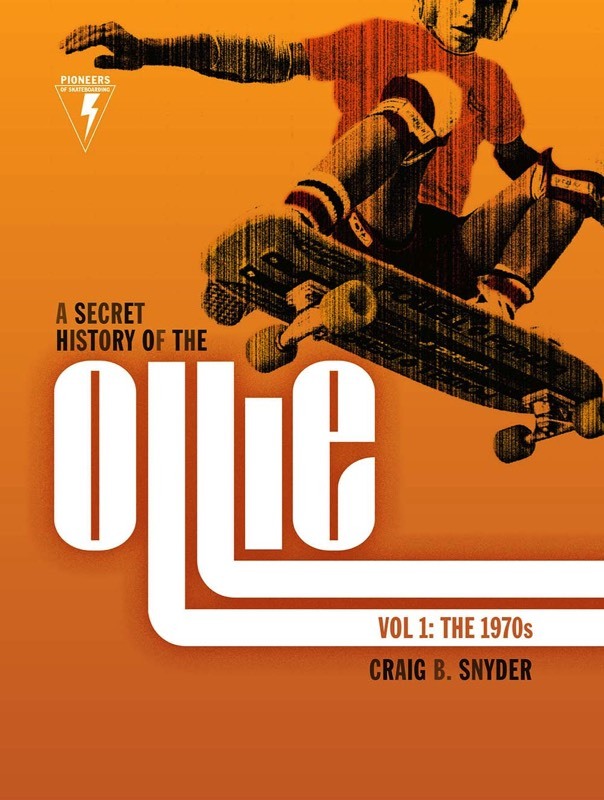 "[A Secret History of the Ollie] is a wonderful history textbook on 70's skateboarding unequaled and will stand the test of time." "It is seriously the best book I've read yet on skateboarding history—the intimate details as well as the broad view of the industry and pastime is phenomenal." "[Volume One] will be the reference point for all other ’70s-era skate histories going forward. The book’s layout never feels dull, either, mixing images, quotes, boards, captions, and easily digestible chunks of text to enjoyable and educational effect." "If there was a university-level class on skateboarding history, this would be the textbook." "A Secret History of the Ollie is a massive book packed full of details, histories, anecdotes, photographs and miscellanea about 1970s skateboarding—not just California, but also Florida, other US states and the international scene. Snyder obsessively details exactly who did what, when, and where. It is amazing detective work, and at over 900 full-colour pages, a great value." "Craig Snyder's work is much more than a secret history of the Ollie. It is a first-rate account of skateboarding based largely on Snyder's extensive research in boarding magazines and his myriad interviews with groundbreaking skaters, the audiences who studied them, and the photographers who immortalized them. Set against the backdrop of the sun-drenched coastal towns of Southern California and South Florida of the 1970s, this book transports readers to the era in which the acrobatics of today's X Games were born." "Positively the BEST skateboard history book I've read. You owe me sleep." "A Secret History of the Ollie is truly a masterpiece, a book to be enjoyed from cover to cover. The stories were riveting and the pictures added so much to the story . . . It brings back a joyful time when experimentation was fueled with possibility. My recommendation is that you need to buy this book! " "Well done. The "On Any Sunday" of books." "If you think you need 900(!) pages of 1970s-to-early 80s skate history that shows that a raging world existed outside of Southern California, then make some room for this thang." "This is #&!% nuts! I cannot fathom how you assembled all of this. I lived through it and was involved in all of it, and there are still things in your book that are new to me. You can definitely be proud of what you accomplished, a master work of research. Thanks for including me." "Thank you for presenting the history of skateboarding in a truthful manner. Our Sport of Skateboarding suffered due to the selfishness of many who sought only their own rewards." "Craig Snyder is a well of knowledge and I am very appreciative of his taking the time to take a look back at the history and bring it to life for those who have no clue, and for all of us who skated for little or no money—only the glory of camaraderie and raising the learning curve every time we went out." "It is the kind of book that will be timeless—25 years from now it will still be relevant." "A Secret History of the Ollie is bolted to the floor and torqued perfect to NASA specs." Award-winning author, photographer, and skate culture historian CRAIG B. SNYDER grew up skating with Alan "Ollie" Gelfand, Mike McGill, Rodney Mullen, Mike Folmer, Mark Lake, and many of Florida's other pioneers and skate stars. His work has been featured in Der Spiegel and ESPN Magazine as well as in top skateboarding publications such as Transworld SKATEboarding and Concrete Wave Magazine. He also worked as a staff photographer for Skate Rider, and was a contributor to SkateBoarder, National Skateboard Review, and Wave Rider. In 2011, Snyder was inducted into Florida's Skateboard Hall of Fame. In 2013, he became part of the "Save the Bro Bowl" movement, and working alongside Shannon Bruffett, was instrumental in getting the historic 1970s Tampa skatepark listed on the National Register of Historic Places (October 2013). Snyder is also Co-Founder of Skateboarding Heritage Foundation, a 501(c)3 nonprofit dedicated to the preservation of skateboarding history for current and future generations. A key part of the story-telling in A Secret History of the Ollie was the photography and it came from a variety of sources that included professional photographers, amateur shooters, and the skaters themselves. A partial list of the book's contributing professional and skate photographers includes Jim Goodrich, Lance Smith, Warren Bolster, Bruce Walker, Al Porterfield, Hunter Joslin, Jonathan Utz, Guy Motil, Tom Dugan, Jeff Divine, Tom Servais, Darrell Jones, Ted Terrebone, Bruce Hazelton, J. Grant Brittain, and Nicolas DelValle. Brief biographies of some of these photographers can be found below. Hailing from the San Diego region, Jim Goodrich was a staff photographer for SkateBoarder during the 1970s, a magazine that was considered "the bible" for skating at the time. During his tenure at the publication, Goodrich made numerous attempts to broaden the magazine's coverage to include skaters and events outside of the Southern California region. 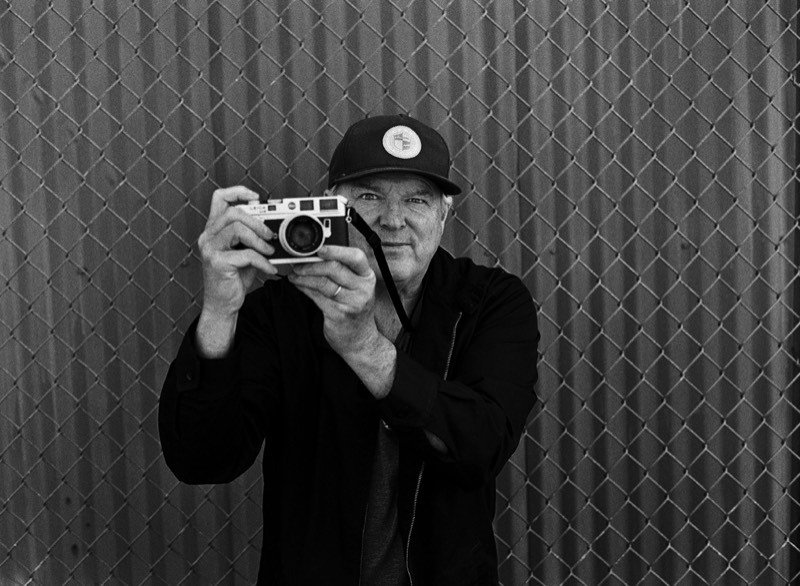 Besides his influential editorial work in the skate press, Goodrich was also employed by the industry as a team photographer for brands such as Gordon & Smith and Gullwing trucks, and later headed TransWorld Skateboarding as its editor during the mid-1980s. Goodrich brings some of his iconic East Coast and West Coast images to A Secret History of the Ollie. In addition to his previously published images, Goodrich is also sharing some of his never-before-seen images. 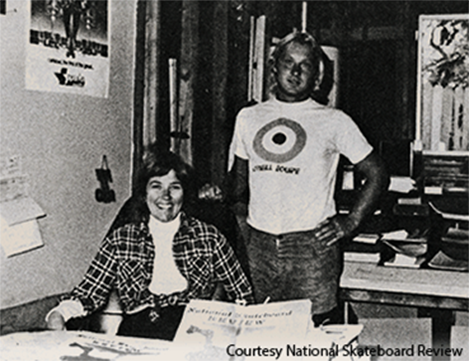 After moving to Florida in 1969 to attend the University of Miami, Bruce Walker helped lay down the foundation for the progressive surf and skate scene in Florida. Walker wore many hats during the 1970s. He was a high-profile skater (with a "Who's Hot!" profile in the very first issue of SkateBoarder in 1975), an innovative manufacturer (through Fox, Ocean Avenue Surfboards, and Walker Skateboards), an influential coach and team manager (Jim McCall, Rodney Mullen, Matt Kechele, and Kelly Slater were some of the riders he mentored before they found global fame) and a filmmaker. As a photographer, Walker was also omnipresent, documenting some of most incredible moments that took place within skateboarding during its Golden Era. Walker's unpublished early work is featured in A Secret History of the Ollie and helps document some of more important historical moments. 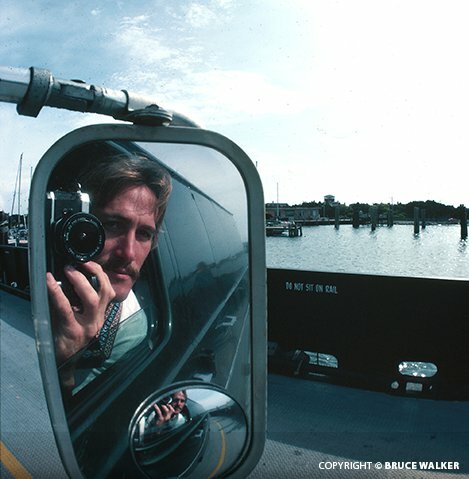 Bruce Walker, self-portrait in the Ocean Avenue/Walker van, 1970s. Lance Smith began skateboarding and surfing during the 1960s before turning to photography in the 1970s, whereupon he captured some of skateboarding's greats—both known and unknown. 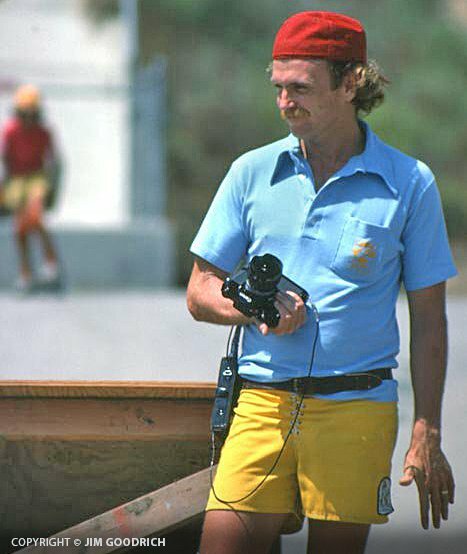 His official entrance to skate photography took place around 1975 when he befriended Dave Dominy, the designer of the new and revolutionary Tracker truck, and became the official photographer for the startup headed by Dominy and partner Larry Balma. Soon after, Smith served as the chief photographer for National Skateboard Review, a magazine that was published by Di Dootson, which became a critical voice for the grass roots side of skateboarding. Smith was also contributor to other skate magazines such as SkateBoarder and Skateboard World. In A Secret History of the Ollie, Smith shares some of his rare and historic work for the first time. 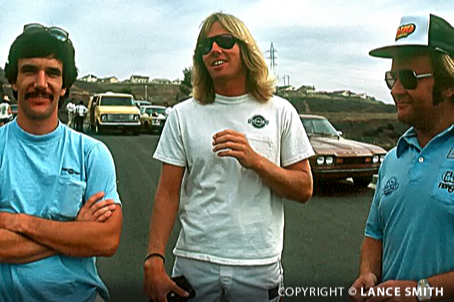 Lance Smith, right, with Di Dootson, Carlsbad, California, 1977. Photo: Courtesy of Dootson. As the editor who revived SkateBoarder in 1975, and who served as its editor-in-chief and leading photographer from 1975 to 1978, Warren Bolster helped define, popularize, and even steer skateboarding during its rebirth in the 1970s. Born on the East Coast of the United States in Virginia, Bolster spent most of the 1960s in Australia, where he learned to skateboard, and Cocoa Beach, Florida, where he learned to surf, before taking up residence in San Diego, California in 1970. In 1972 he became an associate editor at Surfer Magazine, which lead to his eventual post at SkateBoarder through publisher Steve Pezman. Bolster passed away in 2006, but thanks to Michael Brooke, publisher of Concrete Wave Magazine and The Legacy of Warren Bolster: Master of Skateboard Photography, Bolster's images have continued to be enjoyed by others. Bolster's eye for subject, composition, and color were unique, and his legendary images help tell part of the story in A Secret History of the Ollie. An avid photographer before attending the University of Miami as a communications major in the mid-1970s, Jonathan Utz captured some of the unrivaled skating that was taking place in South Florida during that era. Following graduation from UM, Utz took a photo internship at the Miami News, then worked for United Press International (UPI), and Agence France-Presse, where he found himself based in Miami, Washington, Hong Kong and London for the next 18 years. Utz is now marketing executive at the Naples Daily News in Naples, Florida. Except for one image that was published by SkateBoarder during the 1970s, this is the first time his documentary images of skateboarding have ever been seen or published. Jonathan Utz, in the University of Miami dining hall, Spring 1975. Photo: Courtesy of Jonathan Utz. One of the longest active skate photographers, J. Grant Brittain began shooting in 1979 and continues to this day. 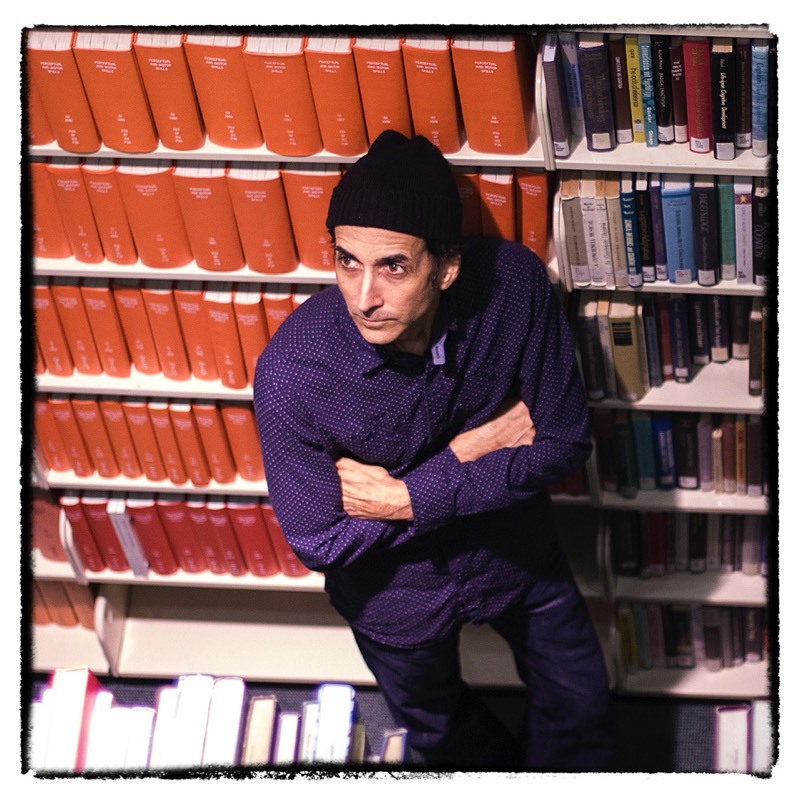 In 1983, Brittain helped found Transworld Skateboarding Magazine and was the senior photographer and sole photo editor there for the next 20 years. Brittain helped TransWorld grow into one of the most popular skate mags in the world, and has captured the best skateboarders of the last two decades in photos that have become classics. He has also taught some of the best skate photographers, past and present, and helped them develop their own work. In 2003, Grant and a few of his buddies left Transworld and started The Skateboard Mag where he remains today. J. Grand Brittain. Photo: © Damon Way, courtesy of J Grant Brittain. Inspired by the world premiere of the first-ever action sports movie, Go For It, in 1976, Al Porterfield picked up a skateboard and camera at the same time, gravitating more towards photography. 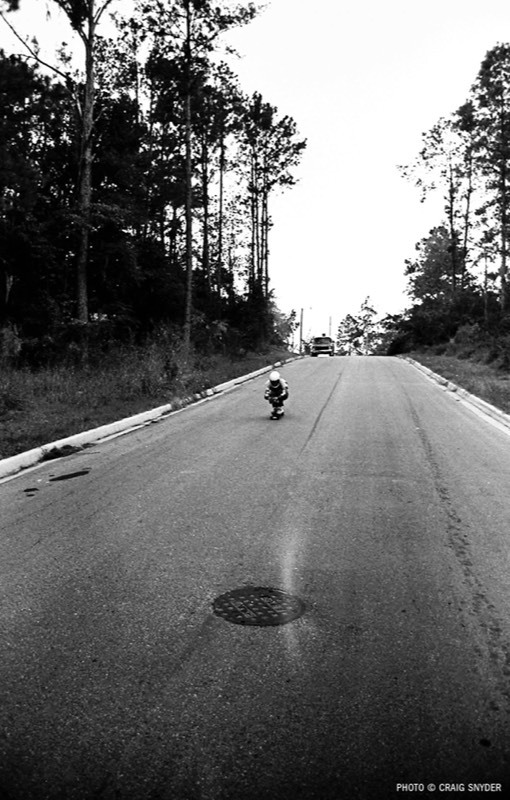 Beginning in 1976, Porterfield helped document some of the explosive skate scene in his home state of Florida. Based in Orlando, Porterfield first captured the Orange Cycle Works skate team, which featured a young upstart and future Bones Brigade founding member by the name of Tim Scroggs. 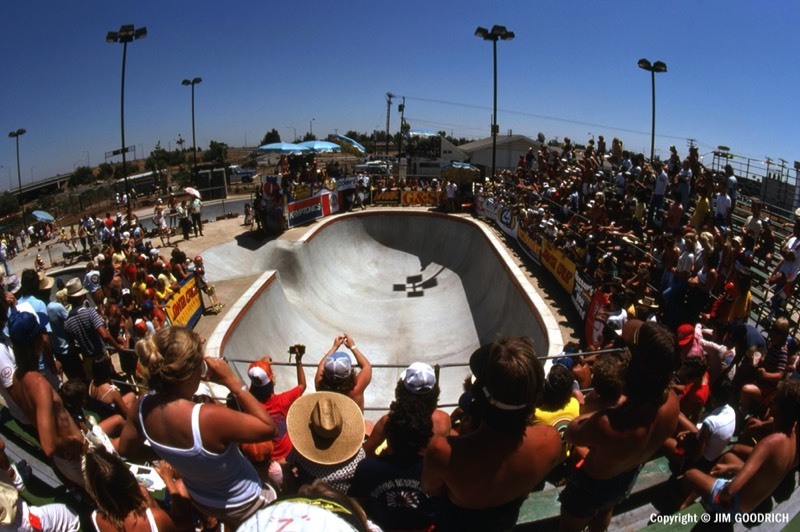 Porterfield also photographed many of the early skateparks and contests, including a number of important Kona events that drew skaters from both coasts. Porterfield's images have never been published and A Secret History of the Ollie will be the first time that many of his images will be seen. Al Porterfield, second from the left, at a Central Florida contest, 1977. Hunter Joslin was a surfer, skater, coach, and photographer who bore witness to some of the important events that take place in A Secret History of the Ollie. Joslin was also a contributor to SkateBoarder, an announcer at the 1978 Hester Series pro skateboarding contests in California, and manager of the East Coast Sims team, which included Florida legends Mike Folmer and Scott "Red" McCranels. Most of Joslin's photography has never been published before, and it helps tell some of the critical story in Craig Snyder's historical work. As the founder of the Indoboard Balance Trainer, Joslin continues to exert an influence over many contemporary and upcoming skate and surf stars through his unique training system. 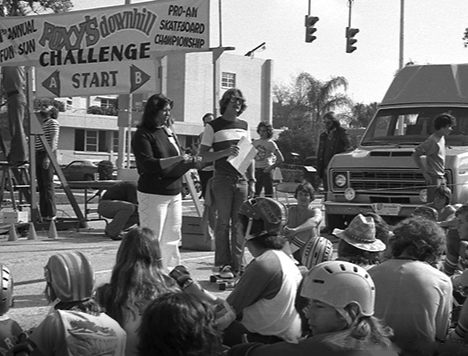 Hunter Joslin, right, speaking to skaters with Muriel Yantiss, at a 1970s contest. Nicolas DelValle is a young, contemporary skate photographer who has the remarkable opening image in the introduction to A Secret History of the Ollie. DelValle's work demonstrates both the global and cultural diversity found within skateboarding, as well as how central the Ollie has become to the activity. From Bogota, Colombia, DelValle began skating in the early 1990s prior to his travel to the United States in 2000. For the next eight years, DelValle skated his way around the U.S. before returning to Colombia. Back in Bogota, DelValle took a serious interest in photography and excelled, arguably becoming one of the best skate photographers in the world with a distinctive style that is truly his own. DelValle, much like the talented South American skateboarders he photographs, remains unrecognized by the legacy skate press, yet he is a titan in his own unique way. DelValle has recently become publisher of Ocho Shortys, his own online skate magazine. Nicolas DelValle, 2012. Photo: Courtesy of Nicolas DelValle.